The Bangla New Year did little to revive Bangladesh's sagging cricketing fortunes as they went down to South Africa by 83 runs in the TVS Cup triangular series here today. Indian captain Saurav Ganguly is likely to sit out of India’s tri-series match against Bangladesh on Wednesday to give rest to his troubled back. It has now become the habit with youngsters in the Indian cricket team to pull off stunning match-winning performances and assistant coach Ashok Malhotra gives the credit for this not only to the "determination" of the boys but also to their inspirational skipper Sourav Ganguly. THE Indian team seems to be going from strength to strength. Another powerful performance on Sunday snuffed out South Africa’s aspirations in quick time. Australia beat the West Indies by nine wickets to win the first cricket Test at the Bourdon Ground here last night. 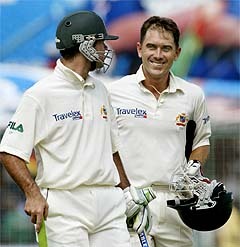 Justin Langer followed up his first innings 146 with an unbeaten 78 to guide the Australians to victory in the opening match of the four-Test series. Australia lost one wicket along the way, Matthew Hayden lofted an attempted pull shot and was caught off Jermaine Lawson’s bowling for 19. Pakistan has dashed hopes of a revival in cricketing ties with India after announcing their withdrawal from the Asia Cup in Bangladesh, a top cricket board official said here today. "We have informed the Asian Cricket Council (ACC) of our inability to participate in the Asia Cup and will issue further details next week," Pakistan Cricket Board (PCB) director Chishty Mujahid said. Tiger Woods’s bid for a record third successive green jacket ended in tatters yesterday after a stunning string of uncharacteristic errors on the front nine of the final round of the U.S. Masters. A double bogey on three and a trio of dropped shots on four, seven and eight combined to defuse the early momentum the world number one had been building. Vijay Kumar moved to the fifth position on the Hero Honda Golf Tour’s 2002-03 season money list after winning Rs 175,000 for his top-place finish in the SRF All-India Matchplay Golf Championship here last week. Formidable Salgaocar Sports Club routed Mahindra United, Mumbai, 5-0 in a 20th round OIL PSU National Football League match at Nehru Stadium here. Serena Williams is capable of losing, and everyone on the WTA Tour can thank Justine Henin-Hardenne for reminding them. The Belgian emphatically ended Williams’ 21-0 start to the season by beating the world’s No. 1 player 6-3, 6-4 yesterday for the Family Circle Cup title. Chasing a stiff target of 295 for victory, Bangladesh were shot out for 211 in 49.3 overs to extend their world record sequence of consecutive defeats to 34 matches. Only opener Mohammad Ashraful and Khaled Mahmud were able to notch up decent scores against a disciplined South African attack led by former captain Shaun Pollock, who finished with figures of four for 36. Ashraful scored 52 runs while Mahmud played an important 40-run knock towards the end which enabled Bangladesh to cross the 200-run mark. Earlier, the South African batsmen made merry as Herschelle Gibbs, Boeta Dippenaar and Neil McKenzie scored attractive half-centuries to help the team to an imposing 294 for three. 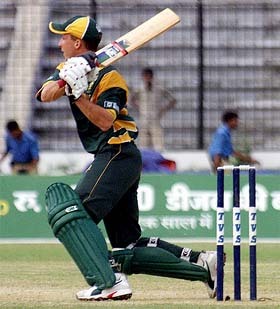 Dippenaar and McKenzie remained unbeaten on 66 and 55, respectively in an unbroken 105-run partnership for the fourth wicket while Gibbs made 62 runs after South African captain Graeme Smith won the toss and elected to bat. Though the home team put up a vastly improved performance, they never seemed to be in the hunt as pressure kept mounting on them after the fall of every wicket. With two defeats in a row in this tournament, Bangladesh are as good as out of contention for a berth in the final. The home team got off to one of their best starts in recent times as both the South African new ball operators Makhaya Ntini and Charl Willoughby strayed in line and length in the early stages. The opening pair of Mohammad Ashraful and Javed Omar fetched 24 runs before Ntini provided the breakthrough by getting rid of Omar, who was caught fishing outside the off-stump. Ashraful was in fine touch and played some audacious shots against the speedsters while the new batsman Habibul Bashar settled into a supporting role as the duo went about building the innings. Smith introduced the experienced Shaun Pollock into the attack in the 10th over and he immediately produced results by making it difficult for the batsmen to score runs. The second-wicket partnership yielded 58 runs before the young Allan Dawson sent Bashar back to the pavillion. Sanwar Hussain, who joined the action after Bashar's dismissal, departed soon after as Bangladesh slumped from comfortable 82 for one to 83 for three by the 18th over. It soon became 112 for four when Paul Adams ended Ashraful's vigil at the crease. Bowling: Aziz 7-0-50-0, Baisya 10-0-54-0, Mahmud 2-0-29-0, Rafique 10-0-43-2, Kapali 10-0-45-0, Sanwar Hossain 4-0-23-0, Ashraful 7-0-36-0. FoW: 1-24, 2-82, 3-83, 4-112, 5-140, 6-141, 7-174, 8-204, 9-210. With India virtually assured of a place in Sunday’s final, having won both their matches so far, Ganguly does not want to take the risk of aggravating the injury and has expressed his desire to be rested, team sources said today. The 30-year-old Indian skipper has been afflicted with the back problem for quite some time now and had even decided not to participate in the tri-series here but changed his mind after a number of key players opted out on various grounds. Indian speedstar Zaheer Khan will miss the next two matches due to hamstring injury, team manager Gautam Dasgupta confirmed here today. Mr Dasgupta said Zaheer pulled his hamstring muscle while bowling his fifth over yesterday and could not complete the same. Saurav Ganguly bowled the last ball. Zaheer would, however, be fit for the final to be held on April 20. He said the Australian physio of Bangladesh team John Gloster had a look at Zaheer's injury and opined that Zaheer would be fit enough to play in the final after getting rest for the next two matches. Zaheer, who did not get any wicket during his 4.5 overs stint against South Africa till he pulled the hamstring had captured four wickets in the inaugural match against Bangladesh on Friday. Ganguly had indicated prior to the tri-series that he would try out all the newcomers in the tournament. The skipper kept his word and three players have already made their debut in the tournament so far. Referring to the tri-series here, Malhotra said the youngsters have shown their "determination despite playing in quite difficult conditions. They have not given away anything." India won both their matches in the tournament, involving hosts Bangladesh and South Africa, in a convincing manner and it has been youngsters Yuvraj Singh and Mohammad Kaif who have walked off with the honours with their superlative performances. Malhotra, whose role here has been restricted to a great extent with John Wright joining the team, is all praise for the captaining skills of Ganguly and credits him for the success of the youngsters. "All the credit should go to Ganguly as he has really worked hard with the boys. He has given them the confidence and backed them to the hilt," said Malhotra. "The team has gelled well under Ganguly and it is a good sign for Indian cricket," said Malhotra who must also be given his share of credit for grooming a clutch of youngsters. As a former national selector and currently the India ‘A’ coach, Malhotra has always advocated the need to blood these talented youngsters and the fact that many of these players have come good has made him a happy man. "There are a lot of talented cricketers in the country and it is good that some of them have proved their worth. It is important to try out these youngsters as we need the back-up players," Malhotra, who will be serving as assistant to Wright during the tri-series here, said. Malhotra was in charge of India ‘A’ which toured West Indies to take part in the Carrib Beer tournament and four of the players from that team — Avishkar Salvi, Amit Mishra, Gautam Gambhir and Abhijit Kale — were inducted in the senior team in the absence of a number of senior players. The presence of Malhotra, who has developed a very close rapport with these players, have made the youngsters feel at ease among the "big boys" as he believes that they have the potential to succeed at the highest level. Malhotra has also been responsible to some extent for the rise of players like Virender Sehwag, Harbhajan Singh, Ashish Nehra, Zaheer Khan and Mohammad Kaif as these cricketers got the break into the national team during his tenure as a selector. But a modest man that he is, Malhotra is not ready to take any credit for the fine show by these players. Malhotra was also full of praise for physical trainer Adrian le Roux for raising the fitness levels of the players. "He has worked very hard and the results can be seen," said Malhotra. The South African trainer was appointed by the Indian cricket board as part of an effort to enhance the fitness level of players and le Roux has been with the team for a year now. Le Roux has brought about innovative drills to make the fitness exercises enjoyable for the players. Malhotra, who had described Mumbai paceman Avishkar Salvi as the "find" of India `A’ team’s tour of the Caribbean, was impressed by the bowler’s performance in his debut match against hosts Bangladesh on Friday. "He bowled well and has a bright future and will improve by playing more and more," he said. THE Indian team seems to be going from strength to strength. Another powerful performance on Sunday snuffed out South Africa’s aspirations in quick time. The batting was at full throttle, the bowlers eager to take wickets and the hunger to win unmistakable. South Africa, desperately low on self-confidence and looking for fresh direction, were simply not up to fighting a side that is running like a well-oiled machine. Six months back, if these two teams had walked out to play a match, the body language of the Indians would have suggested that they were likely to be beaten. On Sunday it was quite the opposite, showing how dramatically India have turned the tide. South Africa played bad cricket. Everything associated with their game — the discipline, the vigour, the aggressive attitude — was missing. I believe a change in leadership and sweeping changes in the side have complicated rather than helped matters. Graeme Smith’s appointment as captain has come prematurely. He should have been blooded in a home series, which is six months away, rather than in the difficult conditions here. Nevertheless, he now has to be seen as an investment and not judged on the results here. Smith himself will have to learn rapidly from his mistakes. To deprive Shaun Pollock of the new ball was an inexplicable decision. Also, he will have to try and make better use of left-arm spinner Paul Adams on these tracks. I thought the Indian charge in the last 10 to 12 overs was fabulous and put paid to South Africa’s hopes of an upset. Happily, runs in this period came from two players — Mohammed Kaif and Dinesh Mongia — who had not made the most of the opportunities in the last three months. Pressure on them to retain their places obviously made the difference, but the more creditable is that both responded to the challenge. A score of 250 was always going to be competitive; to chase more than 300 on this surface was an impossible task. In the oppressive heat and on slow turners, India are clearly the favourites because South Africa will struggle to find wicket-taking bowlers. Australia beat the West Indies by nine wickets to win the first cricket Test at the Bourdon Ground here last night. Justin Langer followed up his first innings 146 with an unbeaten 78 to guide the Australians to victory in the opening match of the four-Test series. Australia lost one wicket along the way, Matthew Hayden lofted an attempted pull shot and was caught off Jermaine Lawson’s bowling for 19. Vice-captain Ricky Ponting hit the winning run and remained not out 42. The Australians earlier took just 41 minutes to wrap up the West Indian second innings with paceman Jason Gillespie finishing with 5-39 for his seventh five-wicket haul in Test cricket. Gillespie claimed 4 for four off 4.2 overs as the West Indies added just 17 runs and lost their last five wickets in 8.2 overs this morning. It was Australia’s first win at the Bourdon Ground since 1978, but they have won four overall of seven Tests at the ground. The West Indies had not been beaten in Georgetown since 1988 against Pakistan. It was Australia’s 13th win in their last 15 Tests and they have now won 13 of 39 Tests in the Caribbean. The West Indies have won 13 with 13 drawn. The second Test starts on Saturday in Port of Spain, Trinidad. Pakistan has dashed hopes of a revival in cricketing ties with India after announcing their withdrawal from the Asia Cup in Bangladesh, a top cricket board official said here today. "We have informed the Asian Cricket Council (ACC) of our inability to participate in the Asia Cup and will issue further details next week," Pakistan Cricket Board (PCB) director Chishty Mujahid said. The PCB took the decision after India refused to tour Pakistan for a Test and one-day series scheduled for April-May this year. Pakistan had said they will not tour India in 2004. The ACC, now managed by Bangladesh Cricket Board officials, had planned to hold the event in August after Pakistan withdrew as hosts. Tiger Woods’s bid for a record third successive green jacket ended in tatters yesterday after a stunning string of uncharacteristic errors on the front nine of the final round of the U.S. Masters. A double bogey on three and a trio of dropped shots on four, seven and eight combined to defuse the early momentum the world number one had been building after a birdie on the par-five second had moved to him to within three of the lead. 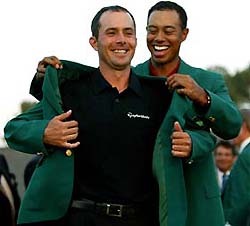 By the time a dejected Woods reached the turn at three-over through nine, the 27-year-old American was trailing the leader and eventual winner Canadian Mike Weir by a massive seven strokes in the chase for a fourth Masters title. While Woods has thrilled golf fans around the world with magical comebacks and improbable victories throughout his career, the hole he dug for himself this time proved too deep, finishing the day at three-over par and two-over for the tournament, nine shots adrift of the winner. "It was just one of those weeks when I couldn’t get anything going," said Woods. "It’s not easy to win three, no one has ever done it." After stumbling through the opening two rounds, Woods had the leaders looking nervously over their collective shoulders after clawing his way back into contention with a third-round six-under 66 on Saturday. With brilliant sunshine bathing the Augusta National course, Woods got yesterday’s final round off to a dubious start when he drove his tee shot right into the fairway bunkers. But after scrambling for par and a well-deserved birdie on the second, Woods looked poised to mount one of his patented charges. Bristling with confidence, an attempt to reach the green on the par-four third proved to be a fatal error, Woods’s drive sailing past the pin into the trees and azaleas resulting in his first double bogey of the tournament. "I got off to an ideal start and just made a mental blunder on three and that cost me a lot of big mo (momentum)," said Woods as he stepped off the 18th green to loud applause. "That was a big error. I just made the wrong decision." A clearly rattled Woods never recovered from the shock, three-putting the par-three fourth as his game disintegrated into a series of uncharacteristic mistakes. A birdie on the ninth offered Woods’s huge gallery a slim glimmer of hope that their hero might mount a charge. But the rally never materialized, Woods battling through the back nine at even par. For Woods, the year’s first major was one of contrasting performances, one moment as gloomy as the rain that plagued the tournament through the first part of the week and the next, as brilliant as the sunshine that kissed the famous layout yesterday. Completing his rain-delayed second round early on Saturday, Woods needed to drain a nerve rattling putt on the final hole just to avoid missing his first cut in a major in seven years as a professional. A few hours later, he returned to the course for his third round firing a superb 66 to surge back into contention. With this win, Salgaocar boosted their tally to 38 points, registering 11 wins, five draws and four defeats and remained on third place below league leader East Bengal with 46 points. Vasco Club has 40 points, while Mahindra United remained on the same eighth place with 26 points from an equal number of outings. For the winners today, goals came through Tomba Singh in the 22nd minute, Sunday Seah in the 32nd minute, Climax Lawrence in the 75th minute and substitute Sebastiao Endro in the 80th and 86th minute. Mahindra, who had an upper hand for the first 20 minutes, made some incisive moves and were almost in the lead on two occasions, but the framework deprived them the lead. In the 17th minute, Monga Aby Samson, after collecting a pass from Debjit Ghosh, unleashed a full-blooded shot, which hit the goalpost and went wide. Mahindra were again frustrated in the 20th minute when another Aby Samson shot crashed into the goal post following a flag kick by James Singh. After this, Salgaocar accelerated the pace of their game and took full control of the play. They shot into the lead in the 22nd minute through Tomba Singh, who headed in a cross from Dharmjit Singh. Salgaocar had a chance to increase their lead in the 28th minute when Tomba Singh passed to Samson Singh, but his shot was smartly saved by Mahindra keeper Nasim Akhtar. The home team consolidated their lead in the 32nd minute through Sunday Seah, when Dharamjit Singh floated the ball towards Seah, who chested it and unleashed a power-packed shot which found the net. Salgaocar could have been up by another goal in the 38th minute had Tomba Singh’s left-footer attempt not hit the goalpost and went wide off a pass from Jatin Bhist. After cross-over, Salgaocar played with renewed vigour and scored three more goals. Lawrence, after receiving a pass from Sunday Seah, scored the third goal in the 75th minute. Later, Sebastiao Endro, who came in place of Sunday Seah, struck two goals in quick succession. BANGALORE: Ghanaian striker Yusuf Yakubu hit a splendid brace as Churchill Brothers Sports Club, Goa, outwitted Hindustan Aeronautics Limited 2-1 here. Yakubu, who had struck 15 of the 25 goals his team has scored going into this encounter, came out with a superb solo effort in the 30th minute to net the equaliser after the aircraftmen had drawn the first blood. KOLKATA: Riding on a first half double strike, Mohun Bagan got past Tollygunge Agragami 2-0 in a lacklustre match here. Brazilian Jose Barreto and teenage talent Sunil Chetri found the target for the fancied Kolkata giants in the slow-paced encounter at the Salt Lake stadium. Serena Williams is capable of losing, and everyone on the WTA Tour can thank Justine Henin-Hardenne for reminding them. The Belgian emphatically ended Williams’ 21-0 start to the season by beating the world’s No. 1 player 6-3, 6-4 yesterday for the Family Circle Cup title. Williams’ last loss came against another Belgian, Kim Clijsters, in the 2002 season-ending Tour Championship in November. She issued a bit of a warning to future opponents. What was perhaps most stunning about yesterday’s final at the clay-court event was the way the momentum turned after Williams won the first three games. All of a sudden, her fourth-ranked opponent won six games in a row, taking 23 of the last 26 points in the first set. With Henin-Hardenne’s smooth strokes right on target, she also overcame a 0-2 deficit in the second set. The Belgian entered the match with a 1-4 career mark against Williams, who won a so-called Serena Slam by winning the last four major tournaments in a row: the French Open, Wimbledon and US Open last year, and the Australian Open in January. That streak led to talk on tour that Williams might be able to get through 2003 without a loss. But she repeatedly has said a perfect season was a lofty goal she never expected to reach. “I think you guys dwelled on it more than I did,” she said yesterday. 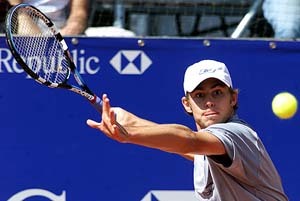 Williams showed some shakiness in the semifinals against former No. 1 Lindsay Davenport, blowing a big second-set lead. Henin-Hardenne made Williams pay for errors, running down shots into the corners and forcing the American to go deeper into points than she wanted. It’s Henin-Hardenne’s second title of the year and improved her match record to 21-4. She won a tournament on hard courts at Dubai in February, beating Jennifer Capriati and Monica Seles in consecutive matches. Yesterday, Williams dropped her racket in frustration after putting a forehand into the net at 3-3 in the second set. She hit long two points later to fall behind 3-4. In the final game, Williams hit a lazy backhand approach into the net to end it. The clay might have dulled her serve a bit, giving the swift Henin-Hardenne more of a chance to get to balls. Williams had nine aces against Davenport, zero yesterday. Henin-Hardenne’s plan was to keep Williams moving, changing pace on her shots the way a baseball pitcher changes speeds.